How can a school become a beacon of health and wellness? 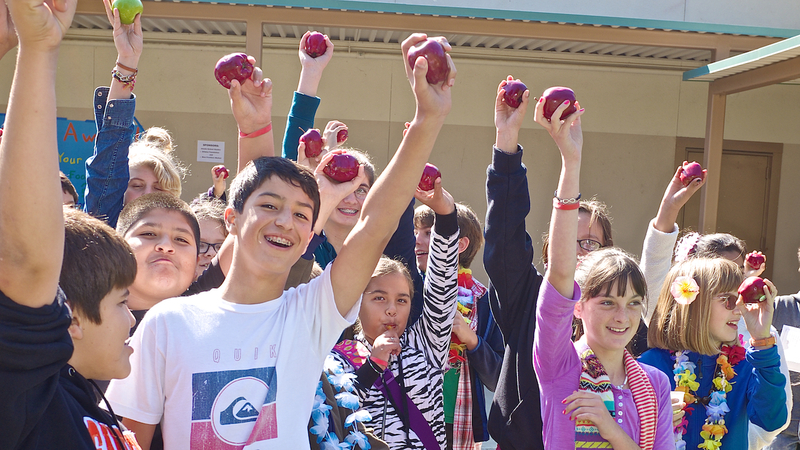 The Orfalea Fund School Food Initiative (SFI) worked with a wide array of stakeholders in local public schools to help them prioritize healthy food and activity practices for students. SFI participated in the drafting of Wellness Policies, served on Wellness Committees, convened stakeholders at an annual School Wellness Summit, and helped Superintendents integrate wellness into California’s Local Control Accountability Plan. In 2006, the USDA required all school districts receiving federal funding for school meals to create a wellness policy that addressed food-related policies, nutrition education, and physical activity. Policy guidelines were vague and school district administrations were not required to enforce the policy. Subsequent iterations of the Child Nutrition Reauthorization Act stipulated more stringent guidelines for wellness policy content, including community transparency and community participation in the policy review and update process, as well as financial consequences for the Nutrition Services Department for noncompliance with wellness policy requirements. Many school districts complied with USDA requirements by downloading “boilerplate” policy templates from agribusiness lobbying organizations such as the American Dairy Council or state Departments of Education. Most teachers and parents remained unaware that a school district wellness policy existed. The length and language of many documents obfuscated the salient points of the policy regarding fundraisers, classroom celebrations, competitive foods (e.g. vending), the prohibition of food as a reward, and guidelines for the nutritional and aesthetic quality of school meals. Coincident with announcement of the Orfalea Fund sunset date, the Foundation’s School Food Initiative (SFI) transferred its focus to sustainability and identified the creation and enforcement of a customized, robust Wellness Policy and active Wellness Committee as key components of preserving and furthering SFI’s efforts. In 2013, the Chef Instructors’ duties expanded to include participation in existing Wellness Committee meetings and presentations to school boards regarding the benefits of creating a customized Wellness Policy and maintaining an active Wellness Committee. SFI also identified the State of California 2014 requirement for all school districts to create a Local Control Accountability Plan (LCAP) as an opportunity to include language and a budget line item in support of establishing a culture of health and wellness on school campuses. The SFI Director and Orfalea Foundation President presented at LCAP community listening sessions, at school board meetings, and with district superintendents recommending the inclusion of support for health and wellness practices as a way to improve pupil outcomes. Despite a USDA requirement established by the 2010 Healthy Hunger Free Kids Act, many school districts failed to establish an active Wellness Committee. Chef Instructors continued to attend meetings despite sparse attendance, inadequate stakeholder representation, and failure on the part of the organizer to promote the meetings to school district employees and the greater school community. The Chef Instructors assisted in recruiting teachers, administrators, school garden educators, public health and medical profession representatives, and school board members to attend Wellness Committee meetings. In school districts with no active Wellness Committee, Chef Instructors enlisted the help of parents, teachers, food service personnel and school administrators to form a Wellness Committee. SFI support for active Wellness committees has provided a model for school districts that have yet to comply with federal requirements and recommended best practices. The Chef Instructors recruited new Wellness Committee participants and in several school districts assisted in the formation of a Wellness Committee. At least one school district included language and allotted a budget line item to health and wellness efforts on school campuses, including workplace wellness for district employees. SFI sponsored a viewing of the film “Fed Up” for over 350 members of a school district’s teachers’ union. Chef Instructors also worked with existing and nascent Wellness Committees to create a user-friendly Wellness Policy “Info Sheet” to be distributed in each student’s back-to-school packet and to all school district employees at the start of the 2015-2016 school year. In 2014, SFI hosted the first annual School Wellness Summit to provide a venue for the elevation of innovative wellness practices, peer-to-peer learning about overcoming obstacles and securing community support for wellness efforts, and establishing a network of champions and aspirants to build upon the work of SFI. Attendees included PTA representatives, teachers, food service staff, school Principals and Superintendents, school board members, and congresswoman Lois Capps. SFI selected a 10-member School Wellness Council to assume responsibility for planning and funding the annual School Wellness Summit, maintain the online School Wellness Forum, and approve mini-grants for projects that support health and wellness on school campuses. In 2015 SFI will co-fund and co-plan the Summit with the School Wellness Council while preparing the Council to take over full responsibility for the annual summit, keeping health and wellness activities and progress at the forefront of high-level school district conversations.